More extreme current forecasting for the 2018 wildfire season in Southwest Kansas is being predicted to be greater in comparison to conditions we saw in March 2017. The county is taking steps to prepare for the upcoming fire danger. At this time we encourage all rural residents to start preparing now. We ask that you clear 100 feet around all structures on your property and mow down grasses an additional 25 feet beyond the 100 foot clearance. 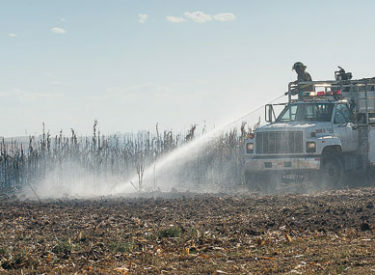 We ask that you trim any trees up away from the ground and that make sure drives into your property is accessible for large firefighting equipment and that the sides of your drives are mowed down 25 feet on both sides. We are also asking you have a plan in place to evacuate and that you have important papers or documents stored for an easy grab if the need arises. You will only have a few minutes to evacuate if the need arises. Additionally have a plan to check in with family members to let them know that you are safe and accounted for. All rural residents can pick up a “Ready, Set, Go” pamphlet at the county fire station located at 110 W. 15th Street to help them better understand how to be prepared for wildfire dangers. If you have any questions please call Seward County Fire at 620-626-3267. All rural residents need to call in to obtain a Control Burn Permit before any open burning is done in the County. We have certain weather conditions and requirements that must be met before we authorize any Control Burn Permits. Permits can be obtained by calling 620-626-3267 or 620-629-7646. We are asking all rural residents to become fire wise in 2018 and help us protect the county from the dangers of wildfires.